Santo Domingo is hard to miss on a map, but for former residents now living in the US, it’s simply far too easy to miss…period. Luckily, unlimited¹ calling to Santo Domingo can be yours thanks to Vonage World Plus Latin America 100. It’s a great plan with plenty of great features. With the Vonage World Plus Latin America 100 plan, you pay a low monthly fee and you get unlimited¹ calls to landlines in Santo Domingo (and the rest of the Dominican Republic), the US, Canada and Puerto Rico, as well as in over 60 other countries, 8 of which are Latin American. The plan even comes with 100 included minutes to mobile phones in Santo Domingo. Even once your 100 minutes are up, you can still enjoy a low per-minute rate to Santo Domingo. 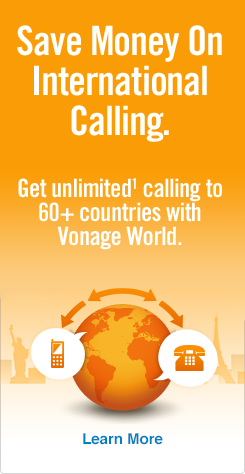 With Vonage Extensions®, you can use Vonage World Plus Latin America 100 on your mobile phone, at no extra cost. Not to mention that all Vonage-to-Vonage calls are free! Next, enter 829 — the Santo Domingo area code, part of the North American Numbering Plan. If you don’t know how to dial other major cities besides Santo Domingo, read up on how to call the Dominican Republic from the US to learn more! There should be nothing left to talk about in terms of calling Santo Domingo from US, but you can read on to learn more about the capital of the Dominican Republic. The Dominican Republic is located on the Caribbean island of Hispaniola, which it shares with Haiti. Santo Domingo hosts nearly 3 million of its citizens and is the site of many of the Americas’ firsts, like the Catedral de Santa María La Menor, sometimes referred to as America’s first cathedral. There’s also the Alcázar de Colón, America’s first castle, former home to Don Diego Colón, son of Christopher Columbus, or you can visit the Monasterio de San Francisco, the very first monastery in either of the Americas. Steeped in history and blessed by temperate climates, Santo Domingo is a “must” for anyone visiting the Caribbean.